A Wrinkle in Time is a cherished childhood classic, and Ava DuVernay, the first black female director ever to helm a $100M movie, was always going to have an uphill battle adapting it. The story, penned by author Madeleine L'Engle in 1962 and co-adapted by Frozen writer Jennifer Lee, is sprawling, challenging, and imaginative, taking three kids across time and space for an epic battle against evil. But DuVernay was right to be a little concerned, expressed in the above quote. It's not that audiences will balk at the idea of a smart black girl saving the goodness in all of humanity (Okay, there might be a few of those. ), it's that the film, for all of its wondrous visuals and good intentions, never takes off and soars the way we keep hoping it will. A noble effort with few moments of true magic, A Wrinkle in Time follows in the unfortunate wake of Black Panther, with audience expectation at an all-time high, especially for another film with an intelligent, powerful African-American protagonist. So much that is right with this film is encapsulated in the opening scene, in which Meg Murry (Storm Reid), a young interracial girl, is introduced to the wonders of science by her father (Chris Pine), a physicist obsessed with the idea of space/time travel. Together with Meg's scientist mother (Gugu Mbatha-Raw), they also introduce her to her younger brother, Charles Wallace (Deric McCabe), a savant and potentially the most intelligent member of the family. But shortly thereafter, Meg's father vanishes into thin air, and four years have gone by with no word from him. His disappearance has turned Meg from a promising, active student into a sullen loner, prone to being bullied but also quick to temper. Meg has the rug pulled out from under her with the arrival of three celestial beings and the movie's poster stars, Mrs. Which (Oprah Winfrey), Mrs. Whatsit (Reese Witherspoon), and Mrs. Who (Mindy Kaling). They tell her that her father's scientific theory of a tesseract is real, and that he's missing somewhere across time and space. The only one who has the strength to save him is Meg, along with her Charles Wallace because he's so smart, and Meg's friend/crush Calvin (Pan's Levi Miller), because he's "good at diplomacy" although I suspect it's because his eyes are so blue and Meg needs a love interest. Diplomacy doesn't really come into it. 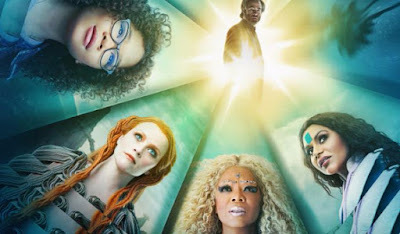 Considered unfilmmable for decades, A Wrinkle in Time encompasses numerous themes that are tough for a story geared towards kids. L'Engle, a devout Christian, wrote the book as a religious allegory that concerns the fight against evil during the existence of a powerful but impassive God. Unsurprisingly, DuVernay has a more grounded focus, like those of a mixed-race girl who feels abandoned by her father and shunned for being different. The film works best when focused on her, and the internal battle she must wage to overcome her hesitation and be the warrior the universe, and her father, need. Sadly, that journey is overshadowed when Meg, Charles Wallace, and Calvin are whisked, or "tessered" away to parts unknown. The adventure that follows is never as harrowing as it needs to be. Worse, most of their encounters are plainly disappointing and don't amount to much of an obstacle at all. The kids are charged with defeating the IT, a thing of pure evil that has begun to infect everyone in the universe, with human heroes that have been fighting against it for centuries. The worst it can conjure up to stop Meg is a suburban neighborhood populated by Stepford families, and a red-eyed Michael Pena as the IT's vaudevillian mouthpiece. Our screening opened with a plea by Duvernay for us to tap into our childlike selves and just enjoy the movie. It's the kind of begging you generally get before a movie underwhelms, showing a lack of confidence in the audience to like it on their own terms. Sure enough it wasn't long after our screening that I heard the first "It wasn't made for you!" excuse in an effort to explain away the disappointment. But Duvernay does occasionally hit on the eye-opening childlike awe that A Wrinkle in Time should be bursting with. A scene where Mrs. Whatsit transforms into a dragon-like creature and soars through the air with the kids on her back is just such a breath-taking moment. Unfortunately it was then followed by a surprisingly tame appearance by Zach Galifianakis as the goofball Happy Medium. He's not the only one who feels out of place. Oprah Winfrey as the looming, towering Mrs. Which is more of a comical eyesore than a being of untold power. She doesn't actually do much but hang over each scene while Witherspoon and Kaling have all of the fun. At least they had plenty of colorful outfits to change in and out of with a twirl. A dazzling array of colors fill the screen and some of the landscapes are astonishingly beautiful, but you keep wishing there were more exotic interplanetary locales for them to visit. You keep wishing there were more characters for them to encounter other than the three celestials. You keep wishing this Wrinkle in Time felt bigger and not so folded in on itself. The blame mostly rests at DuVernay's feet. An accomplished filmmaker who will undoubtedly survive this mishap, DuVernay doesn't seem at all comfortable with a movie of this scope. An excess of extreme close-ups and quick edits make for a disjointed and sloppy effort, particularly noticeable in the final "battle" (It's more like an argument) against the IT. Clocking in at under two hours, A Wrinkle in Time has a strong lead performance by Storm Reid and enough vibrant costumed characters to keep younger aged moviegoers interested. But even with the lavish budget, visual effects, and A-list stars it only just manages to best its less flashy 2003 made-for-TV predecessor.